Create documents in docx, xlsx (MS Office Word and Excel), odt, ods (LibreOffice and OpenOffice) and pdf format without MS Office or others plugins installed from any module and subpanel using templates. Mail Merge Reports helps organizations to solve the needs to generate documents with information of any module and subpanels of SuiteCRM. Can create documents in docx, xlsx (Office Word and Excel), odt, ods (LibreOffice and OpenOffice) and pdf format without MS Office or others plugins installed. You can obtain any number of documents from any module using templates. From version 2.0 the component is completely upgrade-safe and is compatible with all SuiteCRM versions. NOTE: SuiteCRM On-Demand is not yet supported at this time. For all modules, there is a new "Generate Document" action in ListView and a new "Generate Document" button in DetailView. Some example files will be installed by default for the Opportunities module. Open MailMerge Reports ListView to see them. 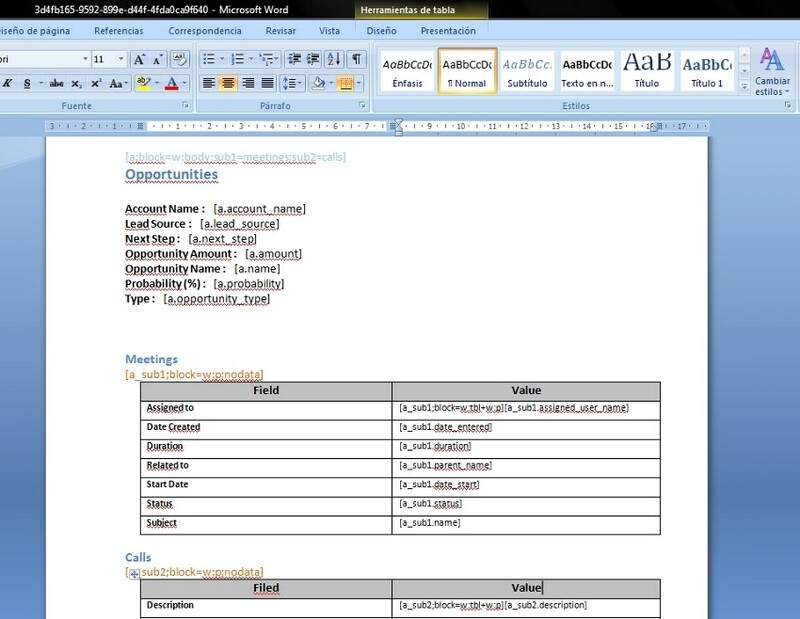 Then go to Opportunities module (ListView o DetailView) to run some of the examples. Go to MailMerge Reports module, and click on "Available variables list & Generate basic template" menu. Then select a module and select some fields to create a basic template. Once basic template is created, you can modify it according to your needs. Create calculated fields from code for any module. Some examples of calculated fields are provided for Opportunities module, and some calculated fields for dates (today) are added by default for all modules.Read the readme.txt file from the zip installation file for more details on this feature. Also you can select specific language for any report template, independently from active language, to format number, date and boolean fields. Some configured languages are distributed with the plugin, and you can modify them or create new language configurations. Read the readme.txt file from the zip installation file for more details on this feature. Available languages: es, es_AR, es_MX, en_US, en_GB, de, fr, fr_BE, it_IT, pt_BR, ca, nl, dk, ru, sv, pl, bg, hu_HU, cs, et, lt, tr_TR, he, id, sk_SK. Merge images associated with Notes and Documents. Images associated with other modules can also be included in reports through calculated fields (consult us if you need this feature). 'Attach to email' functionality. Generate Document and attach to new email directly. 'Attach to Note' functionality. Generate Document and attach to new Note directly. In web hosting services where you can't install LibreOffice or Apache OpenOffice, please download our LibreOffice cde-package, unpack the tar file anywhere and set 'DHA_OpenOffice_cde' config variable (see "Config Variables" section in MailMerge Reports documentation). "It has improved our processes so much! Admin cut in half! 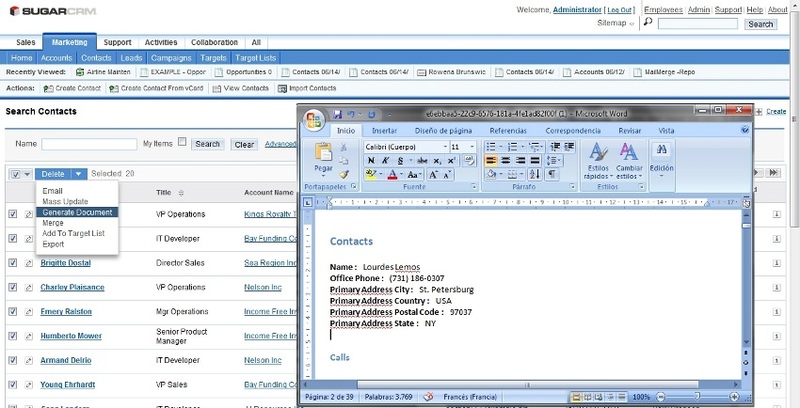 We send a webform to clients to sign up straight into CRM then generate and print their paperwork to sign." 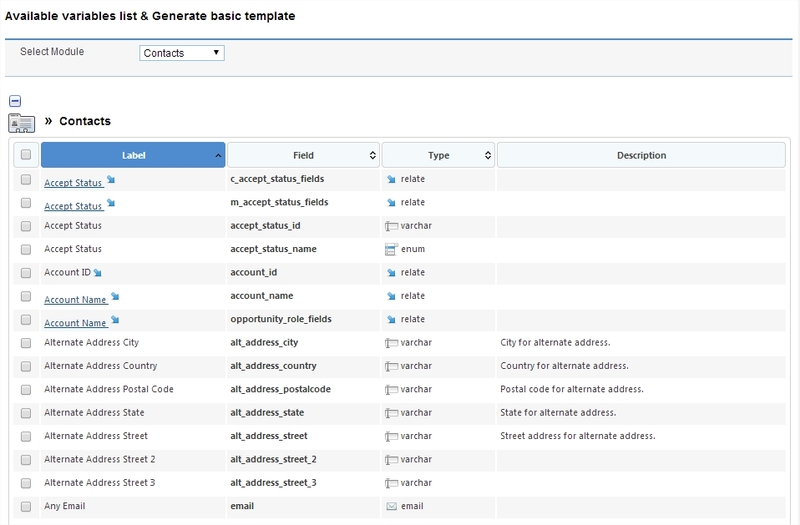 Enhanced PDF Template add-on allows user to generate a PDF for any SuiteCRM module.